China has come out swinging after Mike Pompeo's three-day Latin America tour in which the Secretary of State publicly called out China for spreading "disorder" in Latin America alongside Russia. Pompeo identified the two countries, both of which have over the past two months condemned US efforts toward regime change in Venezuela, of backing failing investment projects that only fuel corruption and undermine democracy, especially in Venezuela. Pompeo had asserted during his tour that Chinese investment and economic intervention in Venezuela, now facing financial and infrastructural collapse amidst political turmoil, had "helped destroy" the country and said Latin American leaders must therefore see who their "true friend" is. “China’s bankrolling of the Maduro regime helped precipitate and prolong the crisis in that country,” Pompeo had stated, and further described Maduro as “a power-hungry tyrant who has brought ruin to his country and to his people”. “I think there’s a lesson … to be learned for all of us: China and others are being hypocritical calling for non-intervention in Venezuela’s affairs. Their own financial interventions have helped destroy that country,” Pompeo added. China is Venezuela’s biggest foreign creditor has provided up to $62bn in loans since 2007, according to estimates. The Chinese foreign ministry didn't hold back in its response: “For some time, some US politicians have been carrying the same version, the same script of slandering China all over the world, and fanning the flames and sowing discord everywhere,” Ministry spokesman Lu Kang said in a Monday statement. “The words and deeds are despicable. But lies are lies, even if you say it a thousand times, they are still lies. Mr Pompeo, you can stop,” the spokesman said. Hinting at Washington's Cold War era record of overthrowing governments in Latin America — a longstanding tradition that can be traced all the way back to the Cold War, the statement added: “The Latin American countries have good judgment about who is their true friend and who is false, and who is breaking rules and making trouble,” Lu said. 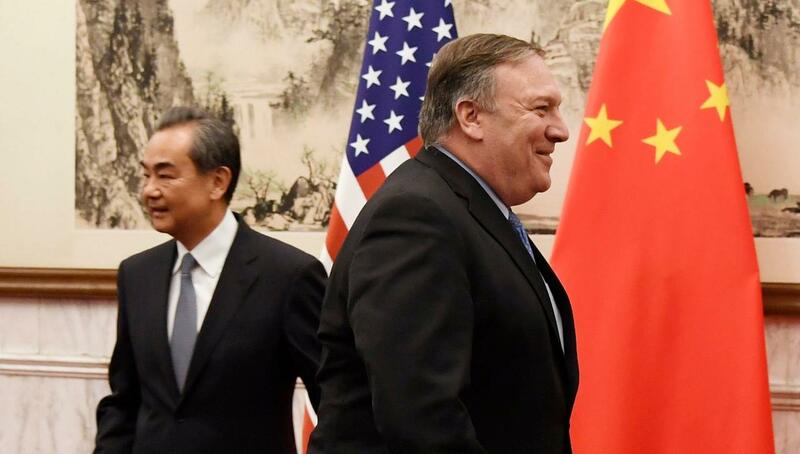 The Chinese Ambassador to Chile's remarks had also remotely invoked a continued Monroe Doctrine mentality on the part of US officials, saying “Pompeo’s body has entered the 21st century but his mind remains in the 20th century, full of thoughts about hegemony and the cold war,” Amb. Xu told La Tercera. In addition to being the Maduro government's single largest creditor, China has recently offered to help Venezuela with its failing power grid, after a series of devastating mass outages over the past month has resulted in "medieval" conditions amidst an already collapsing infrastructure. This as Pompeo and Bolton came close to positively celebrating the mass outages as proof of the ineptness of the Maduro regime. Beijing also recently denied it has deployed troops to Venezuela after media reports a week ago cited online photos which appeared to show a Chinese military transport plane deployed to Caracas. Given how boldly and directly Chinese officials' Monday statements were, it appears Beijing's patience with Pompeo is running thin, to the point of giving up on a positive avenue with the White House, also amidst a broader trade war. It appears the proverbial gloves are coming off.